Disgusting Country - CHARTER SCHOOL WATCHDOG http://www.charterschoolwatchdog. The author of the email is Ridvan (AKA Ryan) Uysaler who is currently the treasurer of Concept Schools in Ohio. At the time of the email, he was apparently an “overworked and underappreciated” accountant who aspired to be more and/or do less – all in the name of Hizmet. Ryan/Ridvan makes many references to Hizmet. For those new to this blog Hizmet is the name of Fetullah Gulen’s “organization.” Hizmet is Gulen’s massive money-making operation in which his followers, (aka brain-washed cult members), pledge their everlasting loyalty and service – and money – for the better good of mankind – or more specifically – Gulen’s mankind and his billion dollar empire. Gulen’s immense operation controls most of the politicians and police force in Turkey, along with the vast majority of its media outlets. In his ongoing rant, Ryan complains about how his “friends” (that would be his Turkish buddies and co-workers) all have “reasonable” assignments and workloads, but alas, he does not. It seems, at least according to Ridvan/Ryan, that his “friends” are blaming him for all of their respective and collective school related financial issues, and according to him – it’s just not fair. Let’s interject a thought here – Ryan/Ridvan’s email is from 2006, and yet he is still here living and working (and being paid quite well with American tax dollar funds) despite his whining to the contrary. But more than that, why is he still living in this “disgusting country,” (his words – not ours) if he hates it so much? Guaranteed, in 2006 there were many qualified, willing, and able American accountants happy to take his spot. And in 2011 – it’s real likely that our buddy Ryan could easily be replaced with an American who would actually enjoy being gainfully employed – while living in this “disgusting country” (again, Ryan’s quote, not ours). Poor Ryan, he cries that he would rather teach in Turkey or Africa rather than face the consequences of his “sins” that have led him to be “financially and legally” responsible for the Turkish-run, Gulen-inspired, American charter schools (bit of an oxymoron - -ummm). What is most amusing about Ryan’s rant is the fact that he is complaining about his “friends,” to his “friends,” as if any of them care. News flash Ryan, like you – your friends cannot and do not make a move without their Hizmet leader’s approval and blessing, and are all out to cover the own collective asses. Now we suspect that the reason Ryan is still hanging around Ohio and this “disgusting country” is because he enjoys being one of Gulen’s’ “whipping boys,” or maybe – just maybe – that Gulen and the boys found Ridvan/Ryan a little too valuable to piss off and send packing. After all, we can assume that our boy Ryan – one of their long time accountants and treasurer sure knows an awful lot about the accounting books (both sets), along with the Tuzuk slush fund. But then – again – that is just pure speculation…right? And a note to Ryan/Ridvan -- if he finds the United States such a "disgusting country," why is he still here? Oh! Yeah -- that's right -- it's to work here and collect a healthy salary paid with "disgusting" American tax dollars -- all for the sake of Hizmet. Maybe his friends can take up a collection and buy him a one-way ticket back to Turkey (that is if they have enough money after Hizmet gets its share of the Tuzuk money). Affiniza siginarak bir kac dakikanizi rica edecegim. Su anda saat gece yarisina yaklasiyor ve ben yine belki Ohio'ya geldigimden beri yuzlerce defa oldugu gibi kafamda ne yapsam ne etsem diye dusunup duruyorum. I ask you to listen to me. Now, the time is nearing to the mignight and I am again thinking what to do as I have done it hundreds time since I have come to Ohio. Kaderin bir cilvesimidir, yoksa gunahlarimin bir bedelimi bilemiyorum fakat hemen hemen her sene benim pozisyonum tartisma konusu oldu. I do not know if it is my faith or the cost of my sins, but my position has been argued each year. Butun arkadaslar sene basinda makul bir ise tayin edilirken benim tayinim ya belli olmadi yada olmayacak sekilde iki uc vazife birden tevdi edilip(bilemiyorum belkide benim tembelliginden dolayi bana oyle geliyordur) ustelik oldukca saygisiz bir sekilde adam yerine koyup neyi yapabilirsin neyi yapamazsin seklinde sorulmadan "ya butun bunlari yapacaksin yada seni harcariz" seklinde tavirlarla uykusuz gecelerde hizmetteki yerimi sorgulamama sebeb olundu. All friends were appointed to a reasonable position, my appointment was not as obvious or in an unknown way 3 tasks were assigned to me (maybe it is because of my laziness) and also it was very irrreverent not to ask me what I can do or what I cannot do. They made me question my position in Hizmet in an attitude like "either you will do all of this or we will fire you off"
"Sayin hocam her halde hep muhasebecilik yapmak istemezsin seni Turkmenistandanda geri istiyorlar istersen seni geri gonderelim" teklifini omrum oldukca unutacagimi sanmiyorum. O yilin nasil gectigini bir Allah, birde o yili orada gecirenler bildigi halde Abimizin nasil olupta benim hic bir is yapmayip, bir ise yaramayip sadece ve sadece adi bir muhasebecilik(!) yaptigimi zannettigini, buna kimlerin firsat verdigini, ortada bir hak varsa kimden kime gectigini burada sorgulayacak degilim. If you want, we can send you back". Even though only me and the friends who stayed with me know how I lived that year, how can our brother think that I did not do anything, and that I was only an ordinary accountant? I will not interrogate whoever lets him think like that. Zaten bu maile baslarken amacim eski defterleri acmak luzumsuz yere mide bulandirmakta degil. Anyway, my purpose for this email is not to open the issues in the past. The reason of I have lived this way is maybe because of my sins, maybe as some people said, I don't know how to market myself. Fakat bildigim bir sey varsa benim hep birden fazla isim oldu. Bu, belki isimi iyi yaptigimdan, belkide tam bir vazife alabilecek kadar adam olamayip dolgu malzemesi gibi nerede ihtiyac varsa oraya yamanmamdan oldu. Tabiki pek cok baska arkadasada ihtiyac zamanlarinda birden fazla is verildi fakat bu her sene her sene devam etmedi. But, There is only one thing I know which is I always have had more than one job. Maybe it is because I do my job very well, maybe I cannot be trusted to do a job very well so, I was always wanted to help others like filling materials .Of course, others friends were assigned more than one job but it did not go like that this each year. Su anda yine yeni bir yila baslarken sahsen hakaret gibi kabul ettigim ifadeleri tekrar tekrar duymam beni tekrar bir vicdan muhasebesi yapmaya zorladi. Okullarimizin hukuki ve mali yapidaki perisan halinin faturasinin bana cikarilmasina artik tahammul edecek sabrimin kalmadigini size arz etmek istiyorum. Now, starting a new year, hearing the same insulting statements again forced me to rethink. I would like to let you know that I cannot accept to be seen as responsible of the bad situation of our schools financially and legally. Gecen iki sene zarfinda vazifem olmadigi halde Cleveland ve Ohiodaki diger okullarda gerek muhasebeci gerek mudur arkadaslara elimden geldigince yardim ettigimi dusundugum halde; her zaman "sen bunu yapabilirdin fakat yapmadin, sunu yapabilirdin fakat yapmadin, bu perisan halimizin sorumlusu sensin" seklinde ithamlara maruz kalmak, "arkadas bu isler cok onemli, gerekirse parasiyla bir adam bulalim bir Amerikaliya yaptiralim" (sanki bu arkadaslarin adam tutmalarina ben mani oldum, hatta parasiyla tutulan adama gitmelerini ben engelledim) seklinde hakaretvari yaklasimlara sahid olmak beni tek kelimeyle "mavh ediyor". In the last two years, even though it was not my duty, I tried to help the schools in Cleveland and Ohio ,either accountant or director friends. It is killing me to hear that "You could do this but you did not do it, you are responsible of our bad situation.” "Friends, these jobs are very important, if we need, lets find a guy and let an American do them" (as if I blocked them to hire a new guy). Nasil oluyorda sorumluluk verilirken baska bir arkadasa veriliyor para verilirken birisine veriliyorda hesab sormaya gelince yapilamayan islerin hesabi benden soruluyor anlayamiyorum. Karinca kararinca yardim etmeye calistigim her arkadas beni yeteri kadar yardim etmemekle, yeteri kadar calismamakla itham ediyor. Why am I always being responsible for the jobs which are not done? A friend, whom I tried to help as much as I can, accused me of not being helpful to him, not working enough. Arkadaslardan istirhamim artik beni samar oglani olarak gormekten vaz gecmeleri. Ben vazifemi bileyim, yapmaya calisayim, yapmiyorsam veya yapamiyorsamda bana musade edilmesi. I want my friends not to see me as a whipping boy. I want to know my duties and let me do them. Bu baglamda bir ay onceki teklifimi yenilemek istiyorum. I want to repeat my offer that I made last month again. a- Eger bana alti okulun ve kresin mali sorumlulugu verilecekse high schooldaki vazifelerimi almanizi talep ediyorum. Eger bu bir luksse bu lukse katlanmak zorunda kalacaksiniz. a- I ask you to take back my duties at the high school if you will give me the financial resposibility of 6 other schools and kindergarten. b- Aksi taktirde siradan bir business manager gibi high schoolun disinda "hicbir" sorumluluk kabul etmedigimi ve sene sonunda belki ikinci donemde Turkiyeye tayinimi cikartirsanizda hic garib karsilamayacagi hatta siz cikarmasaniz bile istekli olarak ayrilacagimi arz etmek istiyorum. b- Otherwise, as a business manager, I wont accept any other duty except high school, I wont be surprised if you appoint me a job in Turkey at the end of the year or second semester. Even if you do not send me back to Turkey, I want you to know that I will leave as my will. Hizmette pazarlik olmaz vazife verilir ve yapilir seklinde mubarek yaklasimlara, bu adam kendini ne zannediyor giderse def olup gitsin, kac paraysa veririz bir Amerikaliya, yaptiririz seklinde ukalaca tavirlara girilmeden bana en kisa zamanda "adam yerine koyup" bir cevap verilirse gercekten memnun olurum. With this kind of holy approaches "in Hizmet, there is no negotiation, duty was assigned", Without smart aleckly attitude "Who does he think who he is, he can go away, we can give money to an American how much it costs to do work and make an American do the duty." I will be appreciated if i get my answer as soon as possible by valuing me. Zira artik –sakirtligimifeda ettigim bu pis memleketten bir an once cekip gitsemmi yoksa bu kadar kahrini cekmisken tecrubemi kullanip biraz daha siyasi davranarak meyvelerini yemeye baksammi diye hesaplar yapmaktan, ev alip en az uc bes senelik vatanim kabul etsem, yoksa yeni bir dunyada kadrimim kiymetimin (?) bilinecegi bir iklimde hizmet imkanlari arasammi diye beyin zonklatmaktan biktim, tukendim. Should I leave this disgusting country where I sacrifice my disciple, or while lumping a lot here should I use my experience and behave more political and try to cast accounts for my benefits like buying a new house and accepting here as my country at least for 3- 5 years, or should i search new Hizmet opportunities in a new world where i will be valued? I am tired of thinking about these. Affiniza Siginarak simdiye kadar katlandiysam hizmet icin katlandim. Turkiyede veya Afrikada bir okulda derse girip rehberlik yapmak Allah biliyorki bana daha tatli geliyor. Hizmette vaz gecilmeyecek adam yoktur. Besides, it is not my job, it is not a job which I enjoy doing, Please forgive me, if i have stood till now, I have done it for Hizmet. Allah knows that it is more enjoyable for me to teach in a school in Turkey or Africa. There is no indispensable man in Hizmet. Please do not misunderstand me. I have a friendship with people to whom I send this email. I don't want to accuse anybody, but I have had enough. I know you have lots of work and I am sorry if I talk a lot. P.S. 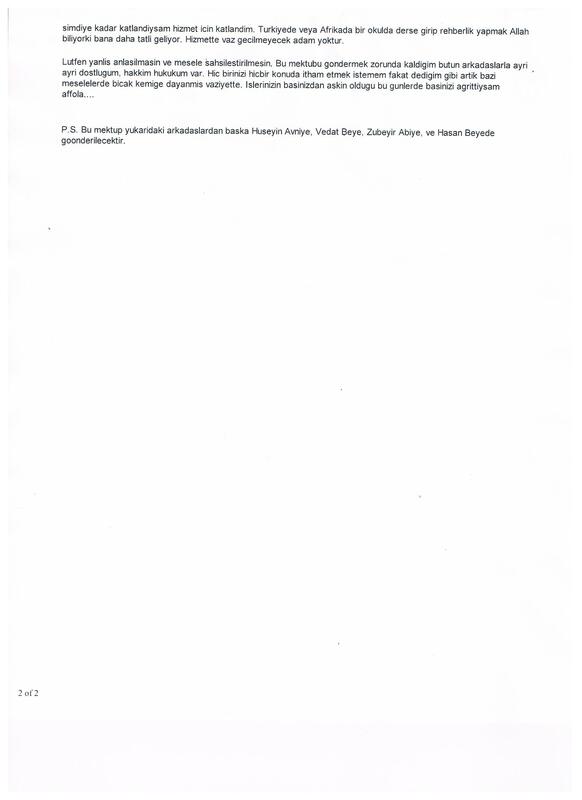 This email will be send to Huseyin Avni, Mr. Vedat, Zubeyir brother, and Mr. Hasan too.